Two fantastic living areas – an open plan lounge complete with dining table and eight chairs, woodburner, 42" television with freeview, movies, and pool table opening onto large verandah with mountain views leading on to garden BBQ area and outdoor five seater spa. The kitchen is well equipped with large walk in pantry, fridge/freezer, microwave , nespresso coffee machine, commercial oven and sink with plenty of bench and cupboard space. A separate breakfast room with table, bench seats, and under stair fireplace with sunny morning aspect is under the mezzanine ‘kids lounge’, perfect for their own space complete with bins of k'nex, duplo, lego, books and puzzles for those rainy days. With the mezzanine sleeping loft of 1 Queen, 1 Double bed and 2x twin beds, king single and lounge area, and two separate bedrooms with one queen, one with ensuite, there is plenty of room for your group. Dog sitting and walking services are available by arrangement. This is an amazing gated hillside property, beautifully landscaped with ornamental ponds and plenty of space and privacy; across the road from a lovely river walk. Plenty of room for dogs to roam. Dogs are restricted to hard floor areas downstairs. Charges for dogs are $20/dog per stay, $30 for two dogs. Check out at 10 am, and check in at 4pm. Log Lodge is only 10 minutes to Ohakune township, then 20 minutes up a forest road to Turoa ski field or 30 minutes around to Whakapapa ski field. A shuttle service, Ruapehu Connections, operates from Raetihi to Ohakune. Up to two dogs are allowed but must be kept confined to the property. They have seven hectares to roam in, but there are sheep on neighbouring properties. Dogs are only allowed on the hard floor areas downstairs in the house. There is a sheltered, covered deck area suitable for dog beds/crates etc. We charge $20/dog per stay, and $20/dog per day for dog sitting. 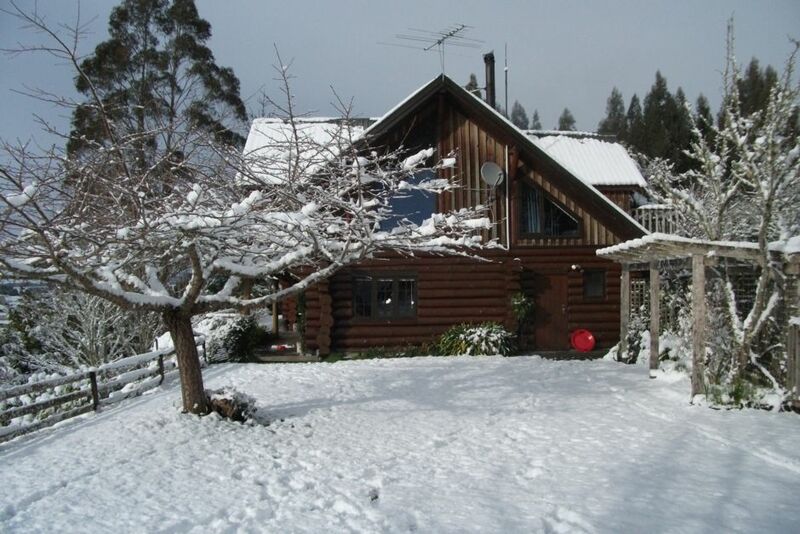 Log Lodge is only 10 minutes to Ohakune township, and then 20 or 30 minutes to the skifields. three quarter size, pool and billiards. assortment of movies in tv cabinet drawer. Wonderful well equipped cabin and fresh flowers for out arrival. Great touch. Perfect cabin for winter family break with lots of room for all ages to find a quiet space.. Pity we could only stay one night. Deb was so friendly through out the booking and greeting on arrival. We were a group of 6 and the lodge had more than enough space to accommodate us, all the facilities and amenities are well maintained and looked after. I loved the book 'shop' and made great use of it. As we were there over Xmas it was great to have lots of board games and puzzles available too. Our hosts also kindly let us borrow their blender. Thanks very much, we had a fantastic Christmas! The log cabin is so lovely! A very clean and well presented property. We loved staying at the log cabin so much we're planning on coming back next year! Private and secluded. Clean, warm and cosy! The kitchen was beautifully equipped (extras like a milk frother were awesome!). Beds comfortable. Thoughtful touches like the fires alight and the cabin warm on arrival. Just lovely! Thank you so much Deb!! As always, the lodge was a great place to stay! As always, the lodge was a great place to stay! Nice and warm when we arrived with plenty of firewood to keep it that way. Highly recommend the place to anyway looking to stay in the area.